A Spanish court could decide on Wednesday if the strike affecting the end of La Liga season is legal. The Spanish Football Federation (RFEF) has suspended the end of the season and the players' union (AFE) also decided to strike in a row over TV rights. The proposed action puts the final two rounds of league games in doubt, as well as the Copa del Rey final. Barcelona, who play Athletic Bilbao in the cup final, are only one game away from wrapping up the league title. 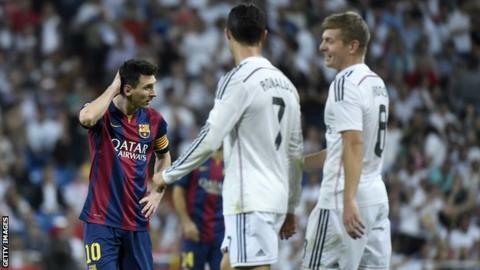 They would become champions by beating current holders Atletico Madrid on Sunday, if the game is played. The RFEF and AFE are not satisfied with a new law, which was supported by the Spanish league (LFP), introducing collective bargaining for domestic television rights. Currently Real Madrid and Barcelona receive most of the TV money. The AFE and LFP have been summoned to make a court appearance on Wednesday, a league spokesperson has confirmed. Essentially, the suspension is the result of a power struggle over who runs Spanish football. More specifically, it is the climax of a long-running dispute over the distribution of television revenue, which is currently heavily weighted in favour of the 'Big Two' of Barcelona and Real Madrid. Read more here.